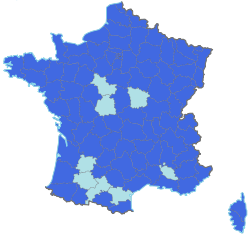 The 1969 French presidential election took place on 1 June and 15 June 1969. It occurred due to the resignation of President Charles de Gaulle on 28 April 1969. Indeed, De Gaulle had decided to consult the voters by referendum about regionalisation and the reform of the Senate, and he had announced he would resign if it resulted in a "no" vote. On 27 April, 53.5% of the voters had voted "no". In the presidential election, the Gaullist Party (Union of Democrats for the Republic, UDR) was represented by former Prime Minister Georges Pompidou. He was very popular in the conservative electorate due to economic growth when he led the cabinet (from 1962 to 1968) and his role in the settlement of the May 68 crisis and winning the June 1968 legislative campaign. In his presidential campaign, he obtained the support of the Independent Republicans and their leader Valéry Giscard d'Estaing, who had voted "no" in the referendum. The French Communist Party (PCF) proposed to the French Section of the Workers' International (SFIO, Socialist Party) to present a candidate with a common programme, but the SFIO refused. The Left was severely divided in this election. The PCF candidate was Jacques Duclos, one of the historical leaders of the party. The mayor of Marseille, Gaston Defferre, was the SFIO candidate and campaigned with Pierre Mendès France, who would have become Prime Minister had Defferre been elected to the Presidency. This candidacy was the first – and so far, only – dual "ticket" in a French presidential election. But Defferre's campaign was weakened by the decision of centrist interim President Alain Poher to run. As Chairman of the Senate, Poher had led the "no" campaign in the referendum. The success of the "no" campaign gave him the legitimacy to run for the Presidency and he rallied a large swathe of centre-right and centre-left voters. Michel Rocard and Alain Krivine stood as candidates expressing the ideas of the May 1968 movements, though the Trotskyist Krivine took a far more radical stance. The first round of voting was held on 1 June 1969. Out of a total of 28,774,041 eligible voters, participation in the first round hovered around 78% of the electorate. Pompidou and Poher won the right to compete in the second round by claiming 43.9% and 23.4% of the vote respectively. The second round saw Pompidou facing Poher. None of the left-wing candidates reached the second round, in spite of the good campaign and result of Duclos, who scored the best ever result for a Communist in a presidential election. The Socialists supported reluctantly the centrist Chairman of the Senate. The Communists refused to choose and used a slogan which was equivalent to the phrase "It's six of one and half a dozen of the other" (c'est bonnet blanc et blanc bonnet). The second round was held on 15 June 1969. About 69% of eligible voters participated. Pompidou was elected President of France with a comfortable majority of more than 57%. 1 2 Berstein, Serge; Rioux, Jean-Pierre (2000). The Cambridge History of Modern France: The Pompidou Years, 1969–1974. Cambridge: Cambridge University Press. pp. 14–15. ISBN 0-521-58061-7. Retrieved 5 December 2011.